Every small business owner wants their business name to resonate with their target audience, be memorable and catchy, and help establish the company's brand. That can create a lot of pressure to come up with the perfect business name. While there are many different business naming best practices, the business naming process and the end result can have some universal similarities. There are hundreds of styles and trends in business names, but six rise to the top as the most common business name styles. Consider these popular styles as you decide what name is right for your business. A unique business name can have the power to be more memorable than its everyday counterparts. This category of business names includes words that are made up, are not frequently used, or have special meanings. If your business name is in this category, there is not likely to be another business with the same name anywhere. Potential Challenges: Business names in this category may be difficult to pronounce and/or spell; it could be challenging for the name to catch on. Mainstream business names use common everyday words and turn them into a brand. You won't find any hard-to-pronounce or made up words in this business naming style, and mispronunciations and spelling errors are not common. Potential Challenges: Mainstream business names may be more likely to be ignored; common words can have multiple meanings; these names could be easy to forget. Business names in this style use a first name, surname or ​another name to distinguish the company. The name used can be a real name that reflects the history of the company. Or, it can be a fictitious name created solely for the purpose of branding. Potential Challenges: Name-based business names could have more than one company with a similar name; some names may be difficult to pronounce and/or spell; there could be issues with the name if the company ownership ever changes hands. Any business name that makes it clear what the company is about can be considered an obvious business name. There may be some crossover with the mainstream business naming style in that these business names are about eliminating confusion about what the company does by using common words to explain it. Potential Challenges: If you have an obvious business name, there may be multiple companies with similar names; obvious business names could be considered boring by some. Trendy business names are popular among technology companies or any business with its finger on the pulse of all that is new. Business names in the trendy style may also be called Web 2.0 business names, although the decision of whether or not a business name is actually trendy can be subjective. Potential Challenges: Relying on a trend that has the potential to change could be dangerous; trendy business names may be difficult to pronounce and/or spell. This business name style takes the initials of the official business name to make an abbreviation that becomes the brand name. Conversely, some business names in this category are based only on the initials, without having a longer official business name. Potential Challenges: It is likely that more than one company will have the same initials; there could be confusion if both the initials and the official name are commonly used. It's important to remember that a business name plays a limited role in creating a successful company and a lasting brand. 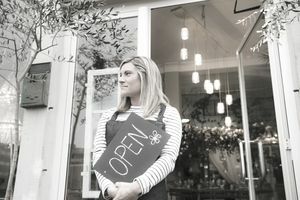 If your business is based on a sturdy, well-developed small business foundation, success is within your reach, regardless of the style of your business name.